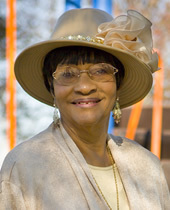 In February of 2006, at the age of 70, Pauline Morgan transformed Williams Playlot into a year-round, multi-functional facility for the Bunche Village community. After seven years of tireless effort, Pauline secured the funding needed to install a heating and cooling system. Through her passion and advocacy, a facility shunned was now embraced as a center for activities and events. Through one woman’s determination and drive, this Metairie community discovered its heartbeat. A Bunche Village resident since 1962, Pauline recognized the Playlot’s unfulfilled potential since it was established in 1964. Playground equipment and some simple structures were added over the years but the Playlot was not a welcoming place. There was no security and minimal lighting. The Playlot became a haven for strangers and a place to avoid after dark. During the day, sweltering temperatures inside the cinderblock gym transformed neighborhood ball games into potential health risks. Pauline Morgan never gave up. Year after year she lobbied, pleaded, cajoled … and educated. And through her conviction, the Playlot is now a safe, welcoming center, bustling with activity. Activities are now scheduled through the recreation department and security staff ensures safety. Dance, G.E.D. and computer classes are just a few new things Pauline has planned for the facility. Pauline believes that everyone has a “light” deep inside them. It is our responsibility she says, to find that light and let it shine. Finding your light requires years of life experience and we’re grateful that Pauline Morgan found hers. Pauline has embraced her mission – her “light”– to improve the quality of others’ lives and help them recognize their ability to achieve. Pauline now runs a food bank from her home…and lobbies for new bus routes to get people to work and school…and explores new opportunities for others to educate themselves and create a better future. Pauline Morgan … Peoples Health Champion.